Let’s start by making herb butter from scratch. You can of course use a store-bought herb butter, but we like to make a lot of food from scratch! FINELY chop the parsley, shallot and cloves of garlic. SCRAPE off some zest from the lemon. ADD 150 gram of dairy butter into the bowl of your stand mixer. Mix the butter, chopped parsley, shallot and garlic together for about 5 minutes and season with pepper and salt. DONE! Wasn’t that easy? PRE-HEAT your oven to a temperature of 200 degrees or 392 degrees fahrenheit. RID both fishes from their fins by cutting it using a pair of scissors. SEASON both fishes with some freshly ground salt and pepper. HEAT up the large skillet on medium-high heat and add in some butter, enough to coat the skillet. PLACE both trouts into the skillet, and bake each side once for about 3 to 4 minutes. Don’t stir, move or mess around with the fishes while baking. The trout should now be nicely cooked and their skin should be crispy. 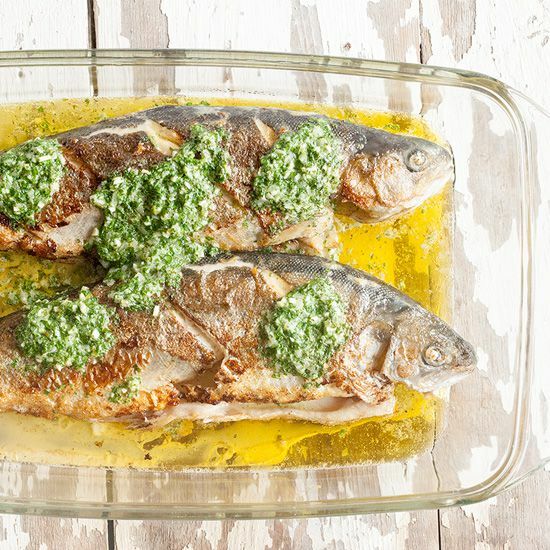 Transfer the fish to the baking tray and add the herb butter on top (see picture). 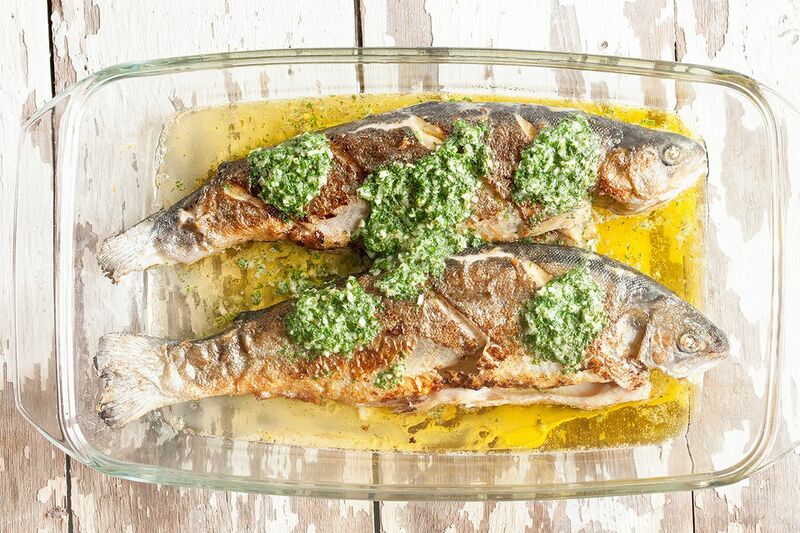 BAKE the fish for about 10 minutes, then remove and serve immediately. 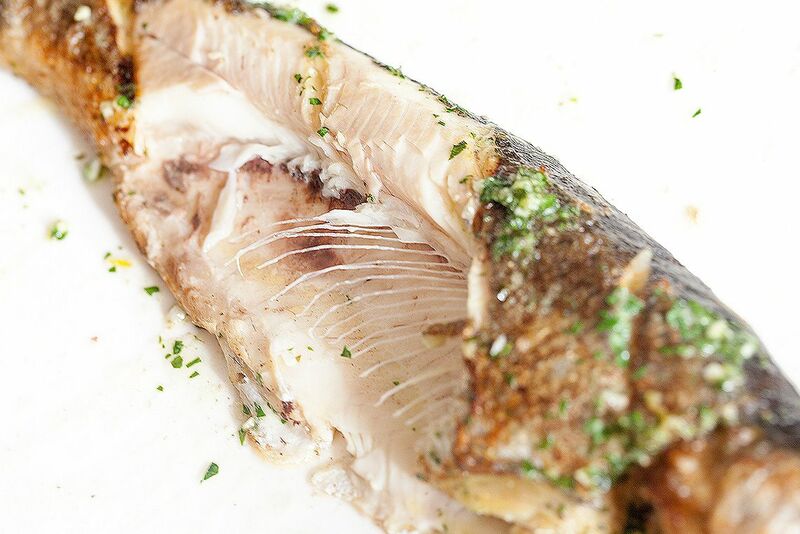 The trout are well cooked when you can pull off its meat from the bones (see picture above). 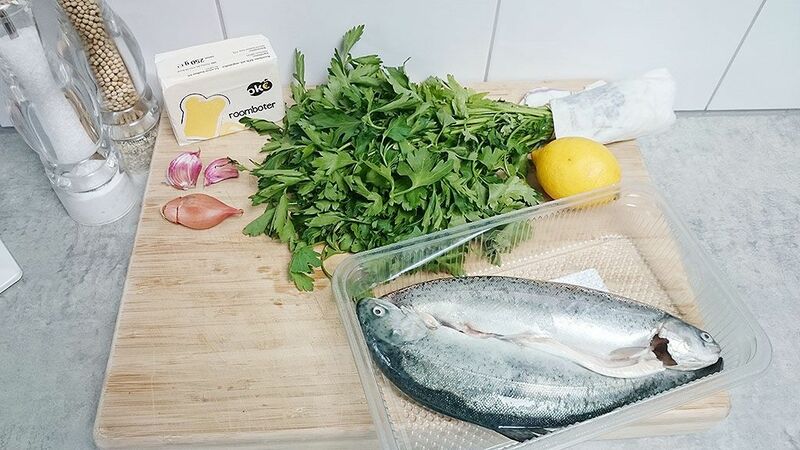 Trout is best enjoyed with a fruity white wine, enjoy!